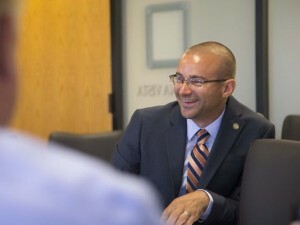 Want to improve schools? Look to Camelback H.S. For communities such as Avondale that are looking for ways to improve their local schools, the renaissance at Camelback High School in Phoenix over the past several years may provide some suggestions. To some the American dream is work hard and you’ll find success. Those words ring very true for graduating senior Lal Len Mawi. The Camelback High School senior can’t wait for graduation next week. “My parents never graduated from high school. So I will be the first to graduate from high school,” Mawi said. 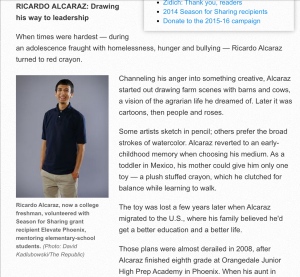 A very nice story about a Camelback student and Elevate Phoenix. 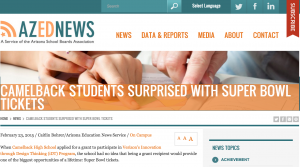 When Camelback High School applied for a grant to participate in Verizon’s Innovation through Design Thinking (iDT) Program, the school had no idea that being a grant recipient would provide one of the biggest opportunities of a lifetime: Super Bowl tickets. Each year when Arizona’s school grades are released, I look up Camelback High School first. I’m rooting for the school because I have this idealized belief that one principal really can transform an entire student body. 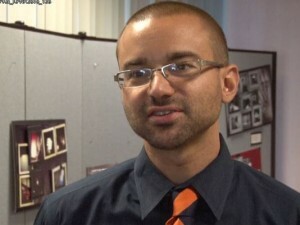 At just 31, Dr. Chad Gestson became principal at Camelback High School in 2009. 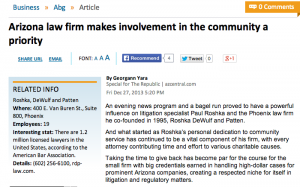 I met him in 2012 at the urging of west Phoenix business leaders. I would be inspired, they said. Paradise Valley Unified School District is moving its alternative schools — Prospect Middle School and Polaris High School — to the former Village Vista Elementary campus, which closed last year. The district governing board approved the relocation at its meeting April 3. 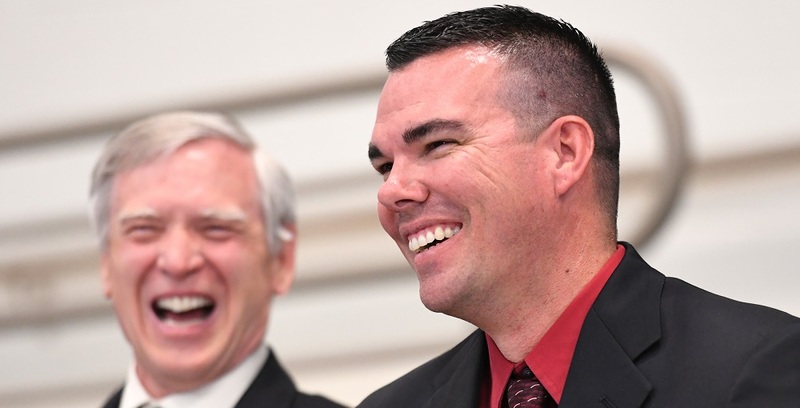 The move would be the first step toward eventually merging Prospect and Polaris into “one 6-12 entity” and likely renaming it, said Patrick Sweeney, the district’s assistant superintendent for instructional support. 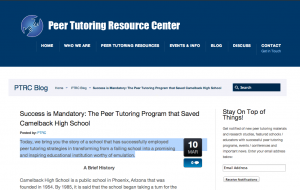 Today, we bring you the story of a school that has successfully employed peer tutoring strategies in transforming from a failing school into a promising and inspiring educational institution worthy of emulation. 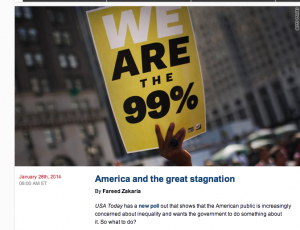 USA Today has a new poll out that shows that the American public is increasingly concerned about inequality and wants the government to do something about it. So what to do? 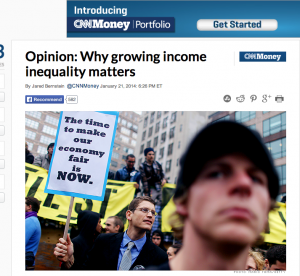 There’s little doubt that inequality has risen dramatically. The most eye catching number might be this one – the world’s 85 richest people own as much as do the poorest 3.5 billion put together. If you put this in American terms alone, the six heirs to the Wal-Mart fortune have a net worth that is larger than the poorest 48.8 million American families put together. These are staggering numbers and it does make for some envy. But envy is not a good basis for public policy. As I have argued before, inequality is made up of three different factors: the rise of the super rich, the rise of a larger group of poor people, and the stagnation of the great middle class. The concern about growing income inequality is not about begrudging the wealthy their success, says economist Jared Bernstein. The worry is that it is curbing everyone else’s economic potential. 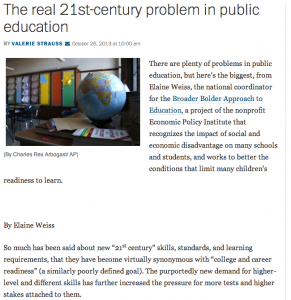 Read the full article by Elaine Weiss. A foundation of stewardship, honor, intelligence, ethics, leadership and discipline is building a model for a new kind of urban high school in central Phoenix. 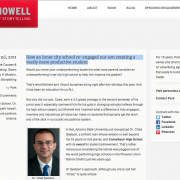 Park Howell blogs about moving his underperforming student son to an underperforming inner city high school … to help him improve his grades. Phoenix: Smart City or Wild West? The new kind of culture at Camelback High School is one based on student participation. Students are required to join an on-campus club or attend at least 20 school events.